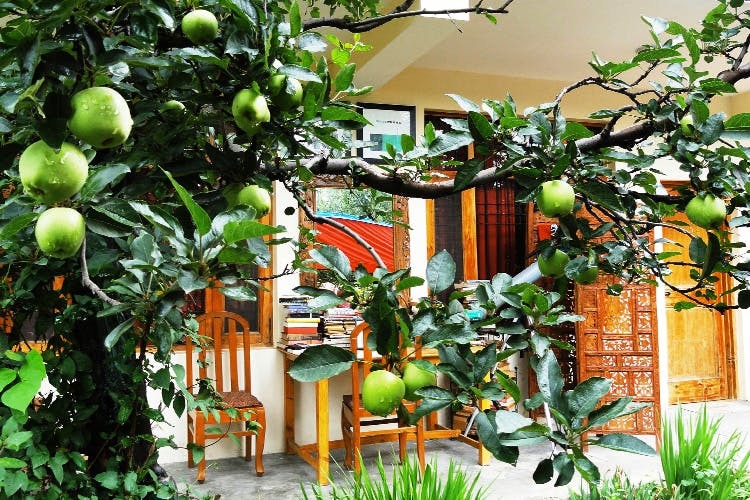 Red House Cafe & Inn is nestled in a quiet part of hippie paradise aka Old Manali. The views from the property are to die for, the rooms are comfy and meals are served under the mellow sun. Tell us if we’re wrong but we’ve had moments when we get so bogged down with everything that we just want to run to the hills and start a quaint bakery. Red House is actually symbolic of that dream. Not only is it enveloped by calm but it’s got the best views in the area. We, however, are making a trip just to attack their small library and music collection. The host and the caretaker make sure that the guests are well-fed through the trip and we’re told that their coffee is something to write home about. It helps that the place has an apple garden cafe that’s ideal for soaking in all of the sun’s restorative energy as you have that cuppa. Other basic holiday requirements including Wi-Fi and clean beds can also be taken for granted at Red House. If you’re a small group or a couple looking for some downtime, look no further. The three rooms and a service apartment are well-equipped and cosy (room heaters to your rescue). Pick the second floor room if you want to enjoy an uninterrupted view of the hills and gardens from the moment you wake up. And, when you aren’t mountain/star gazing (or day-dreaming), you can obviously make good use of the internet. Done with the board games? They organise bonfires every Saturday and forest treks so you can live an outdoor life that’s practically impossible in a city. Whether you’re into nature or chocolate cookies, there won’t be a dull moment around. Go to town, shop for woollies or explore the famous Hadimba Temple. If you’ve got more time, we suggest a trip to Jogni Falls. In short, combine chilling with a bit of sightseeing and do it from the comfort of Red House Inn. Skip the tourist rush at New Manali and enjoy a semi-backpacker-ish life at the inn. Thankfully, this stay comes with home cooked food and clean sheets.